Update on the dome drive project. I have worked hard since the last blog entry to design and implement the printed circuit assembly that senses and reports the position of the dome opening that’s required as feedback for the software that will control the dome’s movements. The circuit is based on three reflective object sensors that sense and count reflective strips spaced at 1 degree intervals around the inside surface of the dome base ring. It works on the same principle as shaft encoders normally found on the back of electric motors whose rotation needs to be monitored precisely. Two sensors are required for keeping count of the distance moved and the direction of motion. The third sensor detects an index strip that marks zero or north point and resetting the degree counters. See circuit diagram for the sensor assembly. 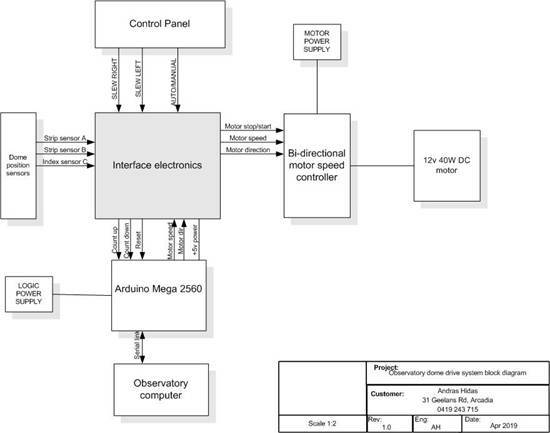 The design for the control electronics incorporating the Arduino microcontroller board and interface to the dome sensor assembly and the observatory computer is finished. Control electronics circuit diagram is here. A feature of the dome control system is it’s dual mode operation. The dome would normally be controlled from the telescope control software running on the observatory computer. It will be able to be slewed to any position by the operator or set to track the sidereal motion of the telescope as it tracks a point in the sky. In addition the dome control will be able to be switched to fully manual operation in isolation from the computer. Also, fired up the Arduino IDE software development environment on another computer. 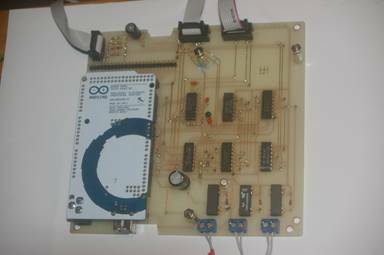 The steep learning curve for writing C++ code for the Arduino was negotiated without too much difficulty as C++ code is very similar to the old Turbo C used to code the observatory software. The critical elements of the Dome Control software have already been tested successfully. These were the control loop tasks including monitoring the regular positioning commands, serial input from the observatory computer, sending the current dome position back in response and updating the dome motor drive control voltage and direction. The current dome position counter in the Arduino is updated by interrupts from the count up and down pulses from the dome sensor and resolver circuits. 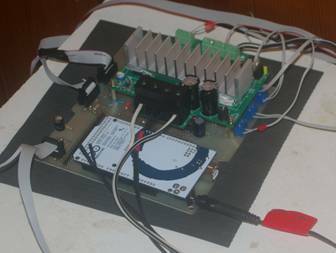 The dome control software running on the Arduino module is now finished and tested offline using a test computer running the observatory computer software and some test circuits that simulate the dome sensor pulses. Arduino code is shown here. Last week the observatory computer went down following a two week period of being switched off and not used during the mid-January heat wave. Temperatures in the observatory regularly reached very close to 40 degrees C and even over 40 some days. It appeared at first to be a major disaster as the OS (Widows XP) would not boot, so a faulty hard disk drive was suspected. An identical computer that was replaced two years ago due to lightning damage was still available and it would also not boot from the observatory disk. Because the older computer was suspect for other reasons, as a last resort it was decided to try the power supply from the old machine in the current faulty computer and it worked. So the observatory is now back online and waiting for cloudless skies. Very busy the last couple of months designing and making the double sided printed circuit board for the dome drive control electronics. This circuit board integrates the observatory computer interface, the dome position sensor, the dome control processor (Arduino Mega 2560) and the motor control circuit. (see picture). The dome position sensing system was completed and tested after applying 360 (marking 1 degree intervals) reflecting strips to the inner surface of the dome base ring. Final testing of the full system with software and all elements interconnected was started last week. Surprisingly only a small number of software bugs were found with the electronics and motor drive system working well. There will be a wear and tear issue with the friction drive wheel rubber tyre rings not quiet being up to the task in the long term. A more robust rubber tyre will be needed in the future. There is still an unresolved software issue with the integration of the dome control function in the observatory control computer. Otherwise the system is ready to be properly packaged up and cabling for power and communications tucked away permanently. It was a buzz seeing the dome slit follow the telescope tracking the sky automatically. Normal observatory activity continued during February and March with two successful NEO follow up observations due to very few clear nights available during the month. The March total was 9 NEOs. The up to date results fir this year can be seen here.